These two media titans are responsible for providing entertainment to tens of millions of consumers. Time Warner's premium cable network is now available over the Internet. Image Source: Time Warner. Investors interested in the world of television have many providers to choose from. Comcast (NASDAQ:CMCSA) and HBO are two of the more significant. But which is the better pick? Let's take a closer look at each business, comparing valuation metrics and assets to see which one may be more attractive. Cable or just the content? Unfortunately, it's currently impossible for investors to buy into HBO directly. The subscription-based network is a television giant, with tens of millions of loyal subscribers around the globe, and an unmatched record of original programming success. But HBO isn't its own publicly traded company -- it's owned by Time Warner (NYSE:TWX.DL), a media giant with extensive assets. Indeed, Time Warner's Home Box Office business (which includes both HBO and its sister station Cinemax) generated just over 19% of Time Warner's revenue last year. The rest came from its Turner networks and Warner Bros. studio. Turner owns many popular cable channels, including CNN, Cartoon Network, TBS, and TNT. Warner Bros. is one of the largest film and television studios in the world, regularly churning out a strong slate of blockbuster films and hit TV series. Comcast has extensive content assets of its own through its ownership of NBCUniversal. NBC is a major broadcaster in the U.S., but also owns several cable channels, including USA, Syfy, and Bravo. Universal competes with Warner Bros. in the production of film and television series, and also owns a few theme parks. Universal has no premium networks comparable to HBO or Cinemax. Last year, NBCUniversal accounted for about 37% of Comcast's revenue. The rest came from its cable service. Comcast offers television, broadband, phone, and home security services to millions of residential and business customers throughout the country. Time Warner, then, is strictly a content company, while Comcast is a television conglomerate, involved in nearly all aspects of the linear programming experience. For that reason, it's no surprise that Comcast is considerably larger -- its current market cap ($148.5 billion) is almost three times the size of Time Warner's ($57 billion). Both firms are profitable and growing. Time Warner generated about $6.9 billion of operating income on just over $28 billion of revenue last year; Comcast brought in $74.5 billion of revenue and $16 billion of operating income. Given that both firms are profitable, they can be assessed using traditional valuation metrics, including trailing and forward price-to-earnings ratios. Trailing P/E is generally preferred, as forward P/E is based on analyst estimates of future performance. In either case, Comcast is the more expensive company: Both its trailing and forward P/Es are higher than Time Warner's. 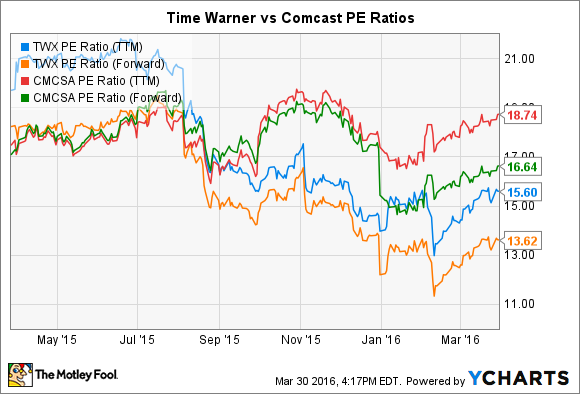 Both firms pay dividends, although Time Warner is a bit more attractive on that basis. Currently, Time Warner is yielding around 2.30%; Comcast is yielding 1.83%. There's a fair amount of overlap between the two companies, but picking one over the other may come down to one's views on the future of the traditional cable bundle. In a world dominated by Internet-based networks and streaming content, both Time Warner and Comcast's cable networks could suffer. Comcast could also see an exodus of paid-TV subscribers. But Comcast is a more diversified company, and owns the pipes tens of millions of consumers will use to access that content. Given its valuation, Time Warner may offer investors greater upside going forward. But Comcast, with its greater diversification, could be the safer pick.